Cosmology does this for the largest structures, and the universe as a whole. In practice, the three professions form a tight-knit family. Ask for the position of a nebula or what kind of light it emits, and the astronomer might answer first. 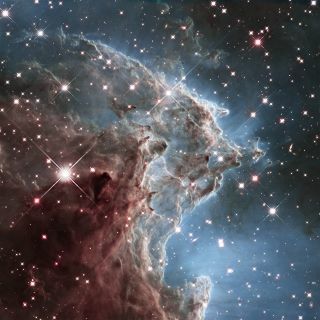 Ask what the nebula is made of and how it formed and the astrophysicist will pipe up. Ask how the data fit with the formation of the universe, and the cosmologist would probably jump in. But watch out — for any of these questions, two or three may start talking at once! Astrophysicists seek to understand the universe and our place in it. At NASA, the goals of astrophysics are "to discover how the universe works, explore how it began and evolved, and search for life on planets around other stars," according NASA's website. While astronomy is one of the oldest sciences, theoretical astrophysics began with Isaac Newton. Prior to Newton, astronomers described the motions of heavenly bodies using complex mathematical models without a physical basis. Newton showed that a single theory simultaneously explains the orbits of moons and planets in space and the trajectory of a cannonball on Earth. This added to the body of evidence for the (then) startling conclusion that the heavens and Earth are subject to the same physical laws. Perhaps what most completely separated Newton's model from previous ones is that it is predictive as well as descriptive. Based on aberrations in the orbit of Uranus, astronomers predicted the position of a new planet, which was then observed and named Neptune. Being predictive as well as descriptive is the sign of a mature science, and astrophysics is in this category. Because the only way we interact with distant objects is by observing the radiation they emit, much of astrophysics has to do with deducing theories that explain the mechanisms that produce this radiation, and provide ideas for how to extract the most information from it. The first ideas about the nature of stars emerged in the mid-19th century from the blossoming science of spectral analysis, which means observing the specific frequencies of light that particular substances absorb and emit when heated. Spectral analysis remains essential to the triumvirate of space sciences, both guiding and testing new theories. Early spectroscopy provided the first evidence that stars contain substances also present on Earth. Spectroscopy revealed that some nebulae are purely gaseous, while some contain stars. This later helped cement the idea that some nebulae were not nebulae at all — they were other galaxies! In the early 1920s, Cecilia Payne discovered, using spectroscopy, that stars are predominantly hydrogen (at least until their old age). The spectra of stars also allowed astrophysicists to determine the speed at which they move toward or away from Earth. Just like the sound a vehicle emits is different moving toward us or away from us, because of the Doppler shift, the spectra of stars will change in the same way. In the 1930s, by combining the Doppler shift and Einstein's theory of general relativity, Edwin Hubble provided solid evidence that the universe is expanding. This is also predicted by Einstein's theory, and together form the basis of the Big Bang Theory. Also in the mid-19th century, the physicists Lord Kelvin (William Thomson) and Gustav Von Helmholtz speculated that gravitational collapse could power the sun, but eventually realized that energy produced this way would only last 100,000 years. Fifty years later, Einstein's famous E=mc2 equation gave astrophysicists the first clue to what the true source of energy might be (although it turns out that gravitational collapse does play an important role). As nuclear physics, quantum mechanics and particle physics grew in the first half of the 20th century, it became possible to formulate theories for how nuclear fusion could power stars. These theories describe how stars form, live and die, and successfully explain the observed distribution of types of stars, their spectra, luminosities, ages and other features. Astrophysics is the physics of stars and other distant bodies in the universe, but it also hits close to home. According to the Big Bang Theory, the first stars were almost entirely hydrogen. The nuclear fusion process that energizes them smashes together hydrogen atoms to form the heavier element helium. In 1957, the husband-and-wife astronomer team of Geoffrey and Margaret Burbidge, along with physicists William Alfred Fowler and Fred Hoyle, showed how, as stars age, they produce heavier and heavier elements, which they pass on to later generations of stars in ever-greater quantities. It is only in the final stages of the lives of more recent stars that the elements making up the Earth, such as iron (32.1 percent), oxygen (30.1 percent), silicon (15.1 percent), are produced. Another of these elements is carbon, which together with oxygen, make up the bulk of the mass of all living things, including us. Thus, astrophysics tells us that, while we are not all stars, we are all stardust. Becoming an astrophysicist requires years of observation, training and work. But you can start becoming involved in a small way even in elementary and high school, by joining astronomy clubs, attending local astronomy events, taking free online courses in astronomy and astrophysics, and keeping up with news in the field on a website such as Space.com. In college, students should aim to (eventually) complete a doctorate in astrophysics, and then take on a post-doctoral position in astrophysics. Astrophysicists can work for the government, university labs and, occasionally, private organizations. Take math and science classes all through high school. Make sure to take a wide variety of science classes. Astronomy and astrophysics often blend elements of biology, chemistry and other sciences to better understand phenomena in the universe. Also keep an eye out for any summer jobs or internships in math or science. Even volunteer work can help bolster your resume. Pursue a math- or science-related bachelor's degree. While a bachelor in astrophysics is the ideal, there are many other paths to that field. You can do undergraduate study in computer science, for example, which is important to help you analyze data. It's best to speak to your high school guidance counselor or local university to find out what degree programs will help you. Take on research opportunities. Many universities have labs in which students participate in discoveries — and sometimes even get published. Agencies such as NASA also offer internships from time to time. Finish a doctorate in astrophysics. A Ph.D. is a long haul, but the U.S. Bureau of Labor Statistics points out that most astrophysicists do have a doctoral degree. Make sure to include courses in astronomy, computer science, mathematics, physics and statistics to have a wide base of knowledge. Natalie Hinkel, a planetary astrophysicist who was then at Arizona State University, gave a lengthy interview with Lifehacker in 2015 that provided a glimpse into the rewards and challenges of being a junior astrophysics researcher. She described the long number of years she has put into doing her research, the frequent job switches, her work hours and what it's like to be a woman in a competitive field. She also had an interesting insight about what she actually did day to day. Very little of her time is spent at the telescope. "I spend the vast majority of my time programming. Most people assume that astronomers spend all of their time at telescopes, but that's only a very small fraction of the job, if at all. I do some observations, but in the past few years I've only been observing twice for a total of about two weeks," Hinkel told Lifehacker. "Once you get the data, you have to reduce it (i.e. take out the bad parts and process it for real information), usually combine it with other data in order to see the whole picture, and then write a paper about your findings. Since each observation run typically yields data from multiple stars, you don't need to spend all of your time at the telescope to have enough work."